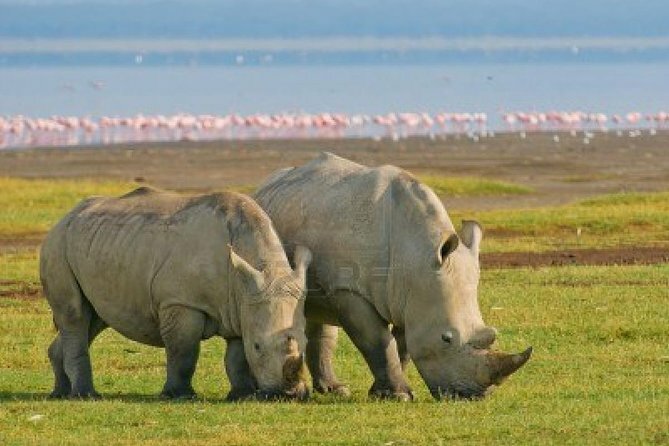 Lake Nakuru National Park hosts the Lake Nakuru a fresh water lake,famous for flamingoes,rhinos BIG 5 except elephants and many species of flora and fauna. 0700hrs you are picked from your Hotel, briefed, thereafter depart for Lake Nakuru with a stopover at the breathtaking Great Rift Valley Escarpment. You proceed for a game drive at the pink Lake of Nakuru from 0930hrs -1330hrs. The lake is dubbed "pink" due to the presence of millions of Greater and Lesser flamingoes among the wild big cats. Enjoy game drive a long side the shores of the lake where you will have an opportunity of seeing millions of migratory birds. In the acacia woodland, you will search for the plain game including the White Rhino. Lake Nakuru National Park hosts the Lake Nakuru a fresh water lake, which is well known for its thousands, sometimes millions of flamingos nesting along the shores. The surface of the shallow lake is often hardly recognizable due to the continually shifting mass of pink. The lake's abundance of algae attracts the vast quantity of flamingos that famously lines the shore. The park has recently been enlarged partly to provide the sanctuary for the black rhino. This undertaking has necessitated a fence - to keep out poachers rather than to restrict the movement of wildlife. The park now has more than 25 rhinos, one of the largest concentrations in the country, so the chances of spotting these survivors are good. There are also a number of Rothschild's giraffe, again translocated for safety from western Kenya beginning in 1977. Waterbuck are very common and both the Kenyan species are found here. Among the predators are lion and leopard, the latter being seen much more frequently in recent times. The park also has large sized pythons that inhabit the dense woodlands, and can often be seen crossing the roads or dangling from trees. At 1330 hrs, you break for Lunch. Thereafter at 1500hrs you depart for Nairobi to arrive at about 1730hrs. On arrival you are dropped at your hotel or JKIA in time depending on your flight’s departure time. Free pick up and drop-off from your Nairobi city hotel or airport. Drinks and all items of personal nature.